The idea for PATIRI in the promised land was not a story I was searching for. I never sat at my computer with Final Draft open and my head in my hands. I was at work on my last project, a web series that I had created called "The Real Page Turner". With 12 episodes of shoot days I had employed more than 50 extras for a one week shoot. Out of all the extras to be paid and fed that week, one… and only one (pay attention:lesson) extra approached me and thanked me for the opportunity. I was wowed. She had a cherubic face, the whitest teeth and a British accent. I was curious. She said she was from Zimbabwe. Now I was very curious. When she said her name, “Vongai” I said, “That’s a warrior’s name!”. I found her on social media, after that, and watched her from the background to see what this kid was about. I came to learn she wanted to stay in the US but was going to lose her student Visa status. Time was not on her side and she was in my country alone, her family, millions of miles away, in Zimbabwe. I pulled her closer as we met a few times so I could glean more of her story. She was a warrior. She had folders of documentation she had compiled as she toiled away at her one and single goal. To stay in America. Then we had a transition in The White House. That was the tipping point. I knew I was meant to tell a version of this young woman’s story. There was urgency. PATIRI in the promised land took on a life of its own. I am pleased to have had the honor to tell a version of Vongai’s tale, and, to have cast her in the role of Patiri, not even knowing if she could act! That wasn’t the point. The story was the point. 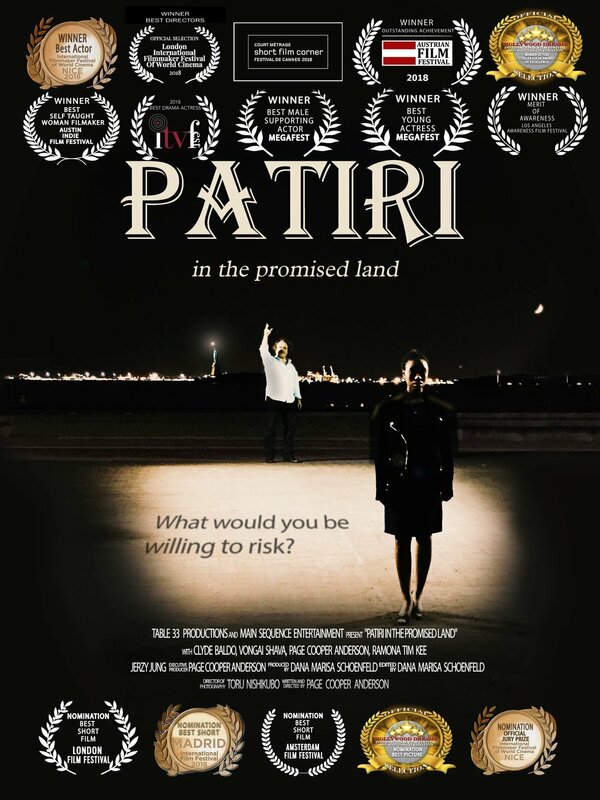 PATIRI in the promised land was a part of a film challenge. It was shot in 4 days.